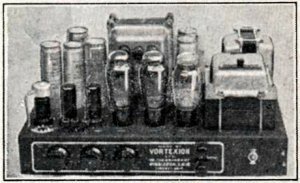 This article takes a look at how the simplest of the valve types, the triode, is put to work as an audio frequency amplification stage, and examines the process of coupling signals between stages while isolating their DC bias potentials using resistor-capacitor (RC) and other coupling methods, with worked examples for RC and choke coupled stages. Examples are also given of practical circuits for a 3W RC coupled triode amplifier, and a 5W pentode amplifier, and comparisons are drawn with solid-state amplifiers, particularly field effect devices. Old technologies rarely die out completely; there are niche uses and particular applications where the properties of a technology are unique. For instance, the stone age is long gone, but we still use stone. The iron age is long gone, but we still use iron. The steam age is long gone, but steam still plays a very important role in electricity generation. Valve technology currently finds niche applications in areas such as RF power amplification, magnetrons for microwave ovens, and audio amplification. Audio-frequency amplifiers are intended to amplify frequencies (corresponding to the number of air pressure variations that occur per second) in the range that the human ear can hear. Frequency is associated directly with musical pitch, i.e. as pitch goes from low to high, so does the frequency. The normal range of hearing for a healthy young human is 20 Hz to 20,000 Hz, and this is the frequency range normally considered essential for high-fidelity (hi-fi) sound reproduction. However, speech covers a range of only about 300 Hz - 5000 Hz, and speech amplifiers need only cover a range of 300 Hz - 3000 Hz. The principles of audio amplifier design aren't only applicable to audio amplification, but also to an extended range of frequencies beyond human hearing, for other applications such as seismic systems, ultrasonic communications and motion detectors, magnetic head amplifiers, and the low end of the radio frequency spectrum. The term "baseband" is sometimes used where the application isn't strictly audio, but applies to the lowest frequency range part of a system, or the first system level beyond an analogue-to-digital or digital-to-analogue conversion. Generally speaking, any audio amplifier will contain a number of individual amplifying stages, which provide power gain between the input (e.g. a microphone) and the output (e.g. to a loudspeaker). There is usually more than one stage, because each device can not by itself provide the entire power gain with low noise characteristics at the input, and low-distortion power driving capability at the output. Between the stages, the design often also incorporates control functions such as input selection, tone control, volume control, balance, etc. and might incorporate stages of digital signal processing, e.g. to implement a graphic equalizer. To isolate the DC bias levels between stages, while coupling the AC signals, (unless stages are designed for a DC interconnection), some form of coupling circuit is required between stages to pass AC signals and block DC. This can involve capacitors, chokes (inductors), or transformers. The most common forms of coupling between small-signal stages are DC coupling and resistor-capacitor coupling (RC coupling), although RC coupling is more common in valve preamplifier stages. Input and output coupling capacitors are normally used but not shown here. "e1" represents the AC signal at the input to the grid, and "e2" represents the output signal at the anode. Cathode bias is used, which means that the valve current that flows into the anode and out of the cathode causes a voltage drop across the cathode resistor R2, which is equal to the desired grid bias voltage. Since the grid is connected to ground via R1, and has essentially zero current flowing, the grid bias relative to the cathode is the negative of the voltage drop across the cathode resistor. The cathode bias resistor must be decoupled for AC signals by C1, otherwise an AC signal developed across the cathode resistor would subtract from the grid voltage, reducing the gain of the stage by negative feedback. The AC signal on the grid causes the electron flow between cathode and anode to vary, equivalent to controlling the anode current, and this causes an AC output voltage to develop across the anode resistor R3. The design of the small-signal amplifier may be based on the small-signal AC parameters of the valve, mutual conductance (gm), dynamic anode resistance, ra, and gain μ which are described in Introduction to Thermionic Valves (Vacuum Tubes). The circuit below shows two stages of a triode valve audio amplifier. The input and output of such an amplifier are usually through additional coupling capacitors, which are not shown as we will be concentrating on the effect of the stage comprising the valve V1, and the coupling between it and the next stage, V2. Also not shown are the heater connections. These are commonly implied in valve circuits, but in practice a heater power supply must be routed to all valves. A typical heater supply is 6.3V for valves whose European part numbers start with E (e.g. ECC83 / 12AX7), at about 300mA for small-signal valves. Apart from a power consumption enough to drive an entire conventional AM/FM transistor radio, the heater supply is also a potential source of noise, and various techniques were necessary to avoid introducing 50 Hz "hum" from the heater supply (as it was normally taken from a mains transformer winding) into the signal path. V1 and V2 are two valve stages in an RC coupled amplifier. Signal voltages are shown as "e1" etc. rather than "v1" to avoid confusion with the valve labels. Each valve is powered from a high-voltage anode or plate supply Vp, via resistors R3 and R6. The RC coupling network comprises the inter-stage coupling capacitor C2, and the grid-leak resistor R4 of the V2 stage. The dotted capacitor Cg represents the parasitic capacitance that appears at the V2 valve grid, which for a triode includes a capacitance from grid to cathode, plus the Miller capacitance (grid-anode capacitance multiplied by the effective gain of V2). 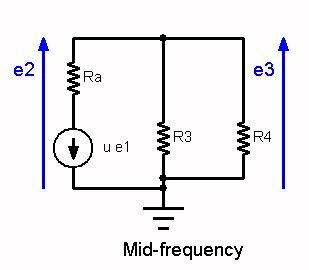 Normally, for triodes, the Miller capacitance dominates, and its effect is to roll-off (reduce) the gain of the amplifier at high frequencies. At low frequencies where the reactance of the coupling capacitor C2 increases, the gain is reduced, thus the inter-stage coupling capacitor affects the low-frequency roll-off and the Miller capacitance affects the high-frequency roll-off. Because of the significant effect of the grid capacitance in a valve circuit, especially with triodes, the high frequency roll-off has to be taken into careful consideration, whereas in semiconductor circuits the high-frequency roll-off is normally well beyond the top end of the audio range. In the mid-band, the roll-off caused by either the coupling capacitor or the effective grid capacitance may be ignored, thus the circuit above may be used. The valve V1 has a characteristic anode impedance, shown as Ra (equal to the slope dV/dI of the anode current/voltage curve), which is in series with a voltage produced by the input voltage at the grid e1 multiplied by the magnification factor of the valve, μ, (which may be shown as u), and is connected to a load of R3 (anode resistor) in parallel with R4 (the grid-leak resistor of V2). It is assumed that C2 has a negligible impedance, while Cg is effectively an open-circuit. In the low frequency band, the bass response rolls off as the impedance of the coupling capacitor C2 increases. The next stage input capacitance Cg can be ignored. As R4 is usually much greater than R3, the bass cutoff frequency is predominantly controlled by the time constant of R4 C2. The cathode bypass capacitor C1 also causes a low-frequency roll-off; it is convenient to make the time constant C1 R2 much longer than C2 R4 so that the interstage coupling capacitors define the corner frequency. If the time constants are similar, the roll-off will be faster, and the input/output impedances will be affected by the changing reactance of the cathode bypass capacitor around the corner frequency. 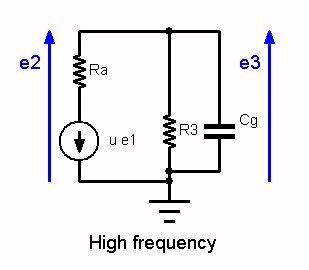 In the high frequency band, the treble or high frequency response rolls off as the impedance of the next stage input capacitance Cg (grid capacitance plus Miller effect capacitance plus any stray wiring capacitance) decreases. The high frequency impedance of C2 can usually be ignored. R3 is often smaller than Ra, in which case the treble cutoff frequency is predominantly controlled by the time constant of R3 Cg. If Ra is not much greater than R3, or is less than R3, then the parallel equivalent resistance can be considered in relation to Cg. 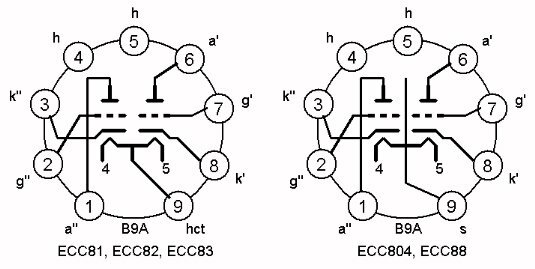 Let's take a look at some data for several common small-signal double triodes. The ECC81, ECC82, and ECC83 have 12.6V, 0.15A heaters, with centre taps for a 6.3V, 0.3A option, and the ECC804 has a 6.3V, 0.3A heater and an extra inter-valve screen on pin 9. Prices of this type of triode in 2011 vary from £8 to £20 or more, depending on manufacturer, age and quality; both old used and newly manufactured types are readily available. 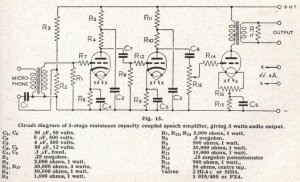 Let's consider an RC coupled stage design using the ECC82. It's a general purpose double triode, suitable for various audio stage applications, including RC stages, phase splitters, and audio driver stages. This will be a Class A stage, in which the anode current flows throughout the whole of the AC cycle, and the grid voltage never goes high enough to cause grid current to flow. It should be capable of about 20 to 50V RMS output at corresponding distortion levels of 2 to 5%. This implies that we should consider up to 50*2*√(2) = 140 V p-p swing on the load line. The data for this valve suggests a quiescent anode current of 10.5mA and anode voltage of 250V. However, this sits close to the maximum power dissipation line, and getting the maximum power level is not necessary for a small-signal stage. Also, reducing the power dissipation can help to improve the lifetime of a design. Voltages for Vp are typically 200-350V, so let's pick 350V and allow for a 50V drop in R7, which together with C4 is there to filter noise from the power supply. Then we have 300V supplied to the anode resistor R3, Va is specified to be 250V, and Ia is 10.5mA (the valve data sheets frequently gave typical operating conditions), so that makes R3 = (300-250)/10.5mA = 4.7k. The value of a grid-leak resistor can be as high as 1Megohm, since there is negligible grid current in normal operation, but allowance has to be made for the possibility of leakage current in the coupling capacitor. The grid bias, produced by the flow of current in the cathode resistor R2, needs to be -8.5V, so R2 must be 8.5/10.5mA = 820 ohms (The grid-leak resistor serves to refer the grid to zero volts, so that the grid bias voltage is the negative of the cathode voltage). The cathode resistor R2 is bypassed at audio frequency by C1, so as to prevent a negative feedback. The reactance of C1 should be much less than R2 at the minimum frequency of operation. so a value of 100μF with a voltage rating a good margin above 8.5V would be suitable. We will assume the both valve stages have the same type of valve and therefore the same grid, cathode, and anode resistors. For the example, G = 6.4. This isn't very high, which suggests we could do better by increasing R3, accepting a lower anode voltage, or increasing the power supply voltage. The power gain is however much higher, as the input impedance is much higher than the output impedance. To obtain a high stage gain, the anode resistor (R3) must be kept high compared with the valve characteristic anode impedance (Ra). If it is too high, too much DC voltage will be dropped, and/or the power supply voltage must be made high to keep sufficient working voltage on the anode. In practice, the anode resistor is set up to four or five times Ra. At low frequencies, the reactance of the coupling capacitor i.e. C2 may become appreciable and the equivalent circuit now becomes that shown in the low-frequency equivalent circuit. The output voltage now appears across the grid leak of V2 attenuated by the series reactance of C2. As the frequency decreases, the reactance of C2 rises and the output voltage is reduced, because voltage is lost across C2. where ω = 2 π f, and f is the frequency in Hz. At the high frequency roll-off, the impedance of the coupling capacitor, as for mid-band, may be ignored, but the impedance of the input capacitance of V2 (Cg) will have fallen sufficiently to create a signal loss. In the high-frequency equivalent circuit, Cg is now a load on the source resistance, Rs, which is the parallel combination of R3 and Ra. The values of R3 and Ra, giving Rs, and Cg should preferably be such that the gain is not reduced below 0.71 at the high-frequency roll-off point. If there are multiple stages, it is the product of all roll-off fractions that is the overall target. In other words, if you have an overall target gain fraction of 0.71 at 20 Hz, and two stages of amplification, then each stage multiplied together must equal 0.71, i.e. 0.84 per stage (0.84^2 = 0.71). Or in dBs, if the total loss is 3dB, each stage in a two-stage amplifier may lose 1.5dB and the totals for each stage must add up to 3dB. As you can imagine, this large an inductor would involve a lot of copper windings on an iron core, which would have to be capable of passing 10.5mA without magnetic saturation, and if it were not for the fact that valve equipment was typically already large and heavy, it would not be a particularly practical approach. This design is from the RSGB Amateur Radio Handbook, 2nd edition, circa 1943 and is an example of a practical 3-stage RC coupled speech amplifier, with a transformer coupled output. "Fig. 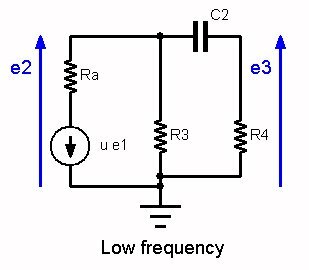 13 shows the circuit of an amplifier which is suitable for use with a transverse current carbon microphone. The maximum output obtainable is about 3 to 4 watts, which would be sufficient for anode-modulation of a lower power transmitter directly for carrier powers up to about 10 watts." 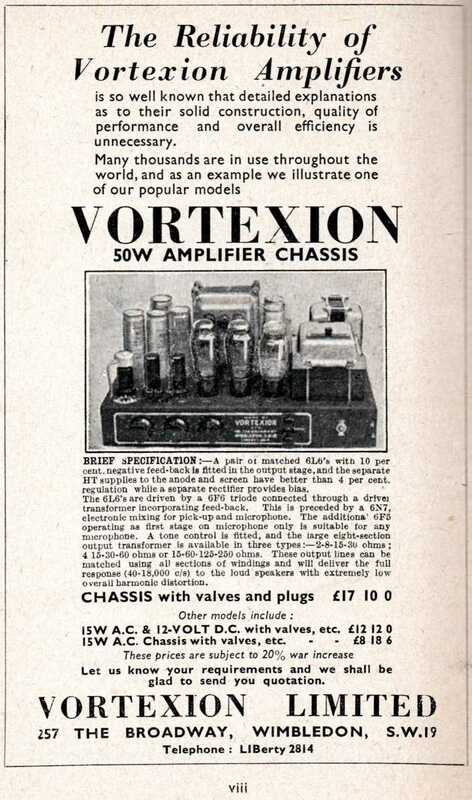 "For larger transmitters, the output is enough to drive a Class A modulator dissipating up to 100 watts. The amplifier is also quite suitable for suppressor grid modulation of transmitters up to 70 watts. The output transformer incorporated (Type TR1 - Partridge) is designed for this purpose. 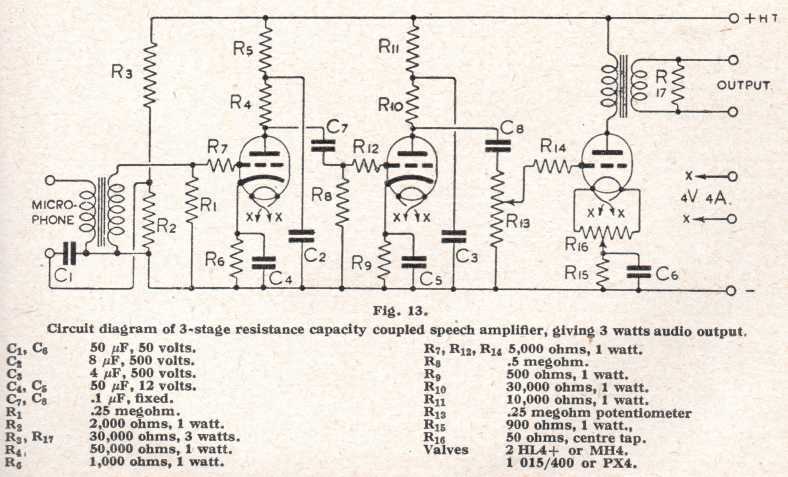 The circuit is seen to be of conventional resistance-coupled design with an input transformer (Type MR300/500 - Partridge) to suit the microphone. The secondary load R1 can be omitted with some transformers. In the grid line to the first and subsequent valves, a grid stopping resistance is inserted as a precaution against R.F. feedback. These resistances have a value not exceeding 5,000 ohms and are of the 1/2 or 1 watt class. Automatic biasing is employed for all stages. To prevent bass cut, each bias resistor is bypassed to earth through a 50μF electrolytic condenser. A high value of by-pass is desirable (so that its reactance is very low compared with the bias resistance) to avoid negative feedback to the grid at the lower frequencies. For the first two stages a 12 volt type is satisfactory, but for the third a 50 volt type is recommended. De-coupling in the first stage is obtained by the use of a 50,000 ohm resistance and an 8μF condenser; in the case of the second stage a 4μF condenser is used in conjunction with a 10,000 ohm resistance. The values of capacity and resistance specified for inter-stage coupling have been chosen to suit the circuit arrangement. The de-coupling condensers C2 and C3 are incorporated to prevent feedback and hum, the former having double the capacity of C3 as these dangers are more likely to occur in the first stage. If feedback should occur in this stage, it is permissible to use two 25,000 ohm resistances in place of R5, in which case a by-pass condenser of 4μF capacity should be connected between the junction of R4 and the lower 25,000 ohm resistance. C2 should then be connected between the centre point of the two 25,000 ohm resistances and earth. It will be noticed that the gain control R13 is fitted to the input of the last stage; this position is recommended as it controls not only audio gain but also the valve noise of the early stages. If the gain control is inserted in the first stage, control of the input level only will be affected. The control takes the form of a .25 megohm potentiometer of the logarithmic type. The automatic bias for the last valve is obtained by the use of a 50 ohm centre-tapped resistance R16 the middle point of which is taken to the bias resistance R15, and this in turn is by-passed to earth via C6. The output transformer has a ratio of 1:1. When used for suppressor-grid modulation, a resistance of about 10,000 ohms should be connected as a secondary load. The necessity of a polarising battery has been overcome by using a potentiometer consisting of a 3 watt 30,000 ohm resistance R3, in series with a 1 watt 2,000 ohm resistance R2. These resistances are connected across the main H.T. supply, and the polarising voltage for the microphone appears across R2. The amplifier is housed in an aluminium cabinet, and the chassis is raised 1" from the base to allow the small components to be mounted on the under side. On top of the chassis are mounted the electrolytic condensers C2, C3, C4 and C5, the three valves and the transformers. All other components are mounted or wired-in on the under side. The output and supply terminals are mounted at the back of the cabinet, whilst the microphone jack is fitted at the left-hand side. The gain control potentiometer is mounted centrally in the front of the cabinet, and ventilation holes are drilled in the lid. The grid stoppers, R7, R12 and R14, should be fitted as closely as possible to the grid pin of their associated valve holders. It should not be found necessary to employ screening for individual components, but the leads to the heater terminals should be twisted and kept clear of the grid wiring. The amplifier has been designed to work from a 350 volt 60mA power supply, but voltages up to 450 volts can be used without encountering danger. A 350 volt supply will give, with the valves specified, an audio output of about 3 watts, which will be increased to about 4 watts if the H.T. is raised by another 100 volts. By changing to a suitable type of output transformer it would be possible to use the amplifier for plate modulation of a 10 watt power amplifier. The filament supply should give 4 volts at 4 amps. It will be of interest to calculate the voltage amplification of the amplifier on the lines indicated earlier in this Chapter. It will be assumed that the valves specified are used. (33 x 50,000) / (50,000 + 11,000) = 27.1. (33 x 30,000) / (30,000 + 11,000) = 24.1. Assuming that the amplifier is to be used with the 10,000 ohm load for suppressor grid modulation, the load on the third valve will be 10,000 ohms, since the transformer ratio is 1:1. (8 x 10,000) / (10,000 + 1,600) = 6.9. 27.1 x 24.1 x 6.9 = 4,340. Now from the table given earlier in this Chapter the peak voltage for a transverse current microphone with suitable input transformer is quoted as approximately 0.2 volts for very close speech. When speaking at a normal distance of, say, 12", this would be in the order of 0.02 volts. This the output voltage with the volume control at maximum will be 0.02 x 4,340 = 86.8 volts. This is more than adequate for suppressor modulation of pentodes up to the 50 watt class, and will allow some reserve in the volume control. If greater gain is required in order to use a less sensitive microphone, such as a ribbon or "cell" type crystal microphone, a screen grid or small tetrode valve can be used in the first stage. A suitable input transformer must be used for a ribbon microphone, but the crystal type can be connected directly into the grid circuit. Owing to the higher gain it may be necessary to use two stages of anode decoupling. 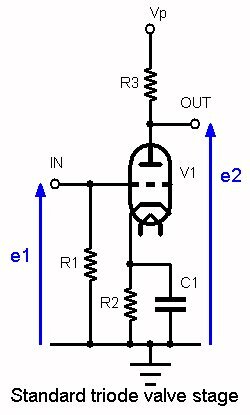 Triodes should preferably be used for later stages in the amplifier unless an output tetrode or pentode is used as the last valve." 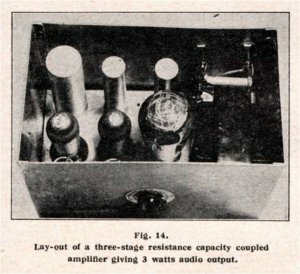 I designed this three valve audio amplifier in the 1970s for use with a crystal microphone and as part of an amateur radio transmitter. The first two valves are low noise EF86 types and the final valve is an EL84, 6P15, 6BQ5 or N709. Co-axial wiring is used throughout for the heater circuitry to reduce hum. The 1S921 diode in the grid circuit of the output valve was intended to provide a crude form of audio limiting, clipping the positive input levels of overloaded audio, and hence, as the stage is inverting, suppressing negative excursions at the output that could produce excessive "sideband splatter" in the modulated stage, assuming choke modulation or transformer coupled plate modulation kept in-phase. The load impedance for the final stage was nominally 4000 ohms. The maximum power output obtained from this amplifier at low distortion was 5.3W. Bias the screen grid at a positive voltage normally at or below the anode supply voltage, with RC filtering to remove AC feedback. Connect the suppressor grid to the cathode or ground, normally decoupled for AC. Allow for differences in characteristics, notably that anode impedance is higher than for a triode. RC decoupling is used along the H.T. rail to reduce power supply noise and feedback progressively towards the input stage V3. A shunt 10pF capacitor on the microphone input, and ferrite beads in line with the grid circuits of V3 and V5, are used in place of "grid stopper" resistors to suppress sensitivity to RF and high frequency parasitic oscillation. To reduce distortion in the output stage, the self bias cathode resistor (150 ohm) is not bypassed to AC with a capacitor. A tape recorder line input is brought in to the volume control at V4, as this signal is larger than the microphone signal and does not need the amplification of the first stage (V3). 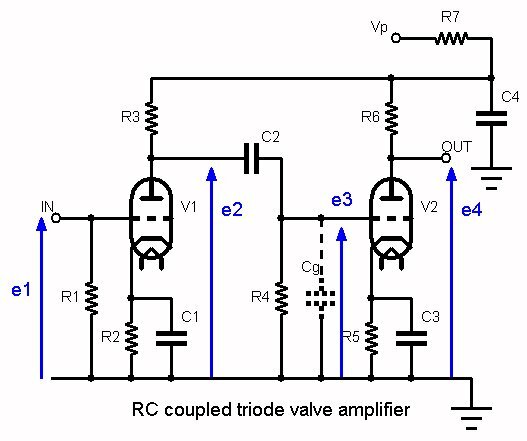 The RC coupled FET Amplifier is very similar to the valve version in many respects, especially in that it is an electric field controlled device. A major difference is that in small-signal amplifiers the voltage levels are all much smaller by 1 to 2 orders of magnitude, and for large-signal amplifiers the voltage levels may be smaller by an order of magnitude or even similar, while currents levels in power MOSFET amplifiers are often much higher than conventional valve amplifiers. As impedance levels are correspondingly much lower than in valve amplifiers, this means that usually it is possible to match power amplifiers to loudspeakers without the use of a transformer. This used to be considered an advantage as there are distortions introduced by transformers (e.g. frequency response, saturation of the magnetic laminations), but valve amplifier enthusiasts argue that a well designed push-pull amplifier taking into account the active stages and the transformer as a whole has a warmer, less grating type of distortion at full load compared with a solid-state amplifier. The JFET, or depletion-mode MOSFET, is the closest parallel to classic valve design, as the operating point normally requires a negative gate bias (for N-channel devices, P-channel has opposite voltage polarities). The enhancement mode MOSFET requires a positive gate bias (for N-channel devices) which requires a slightly different approach to biasing. 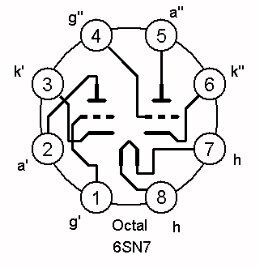 While there is a general parallel with the mode of operation, all the numerical parameters will differ considerably from classic valve technology. In particular, gains are often higher, frequency response is higher which requires attention to stability at higher frequencies, and it is relatively easy for a FET device to be turned on and conduct sufficiently heavily to rapidly destroy the device, whereas with valves the maximum current was limited by the electron emission available from the cathode and an overload would not destroy the device until the thermal inertia of the anode resulted in overheating. Having said that, there is always the need for the designer to ensure that devices operate within their rated absolute maximum specifications. Some applications require more complex bias regulation than illustrated by the cathode bias resistor method above, because of the spread of semiconductor characteristics. A regulator circuit using a linear IC might be used to control a sample of the source or drain current of a microwave MOSFET, where obtaining an accurate bias point is critical. Interstage coupling of valve or FET amplifiers might assume that the loading (due to high input impedances) is negligible, until the loading effect of input capacitance becomes significant at higher frequencies or faster rates of rise, which may be a very important consideration. High power FETs usually have quite high effective input capacitance which in turn requires a low impedance drive and significant current capability from the preceding driver stage despite the FET device having very high input resistance. This is usually a consideration in power amplifiers, and also in switching circuits such as the switching circuits used in switched-mode power supplies. The RC coupled BJT Amplifier also differs from valve amplifiers in that impedances and voltages are lower, and from both valve and FET amplifiers in that the input impedance of the common-emitter amplifier is low, and it is fundamentally a current controlled amplifier. The ratio between collector current and base current is known as beta (β). Design often follows the voltage levels through a system, using the Ebers-Moll model, or simulation by SPICE, but the low input impedance of the BJT stage means that the loading on previous stages is always something that must be taken properly into account.